Go to original pattern for design DROPS Extra 0-1332. DROPS DOUBLE POINTED NEEDLES and CIRCULAR NEEDLE (80 cm / 32'') size 8 mm / US 11 - or size needed to get 11 sts x 15 rows in stockinette st = 4'' x 4'' (10 x 10 cm) before felting. After felting: approx. 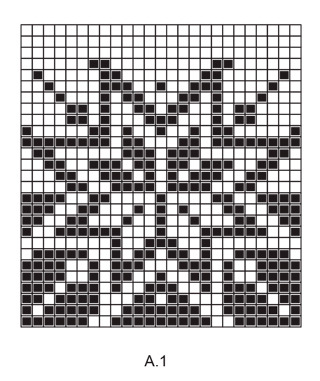 13 sts x 25 rows = 4'' x 4'' (10 x 10 cm). 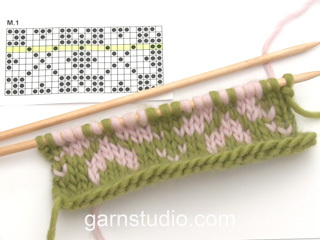 You can get the yarn to make this pattern from	19.95$. Read more. See diagram A.1. Work all sts in stockinette st. 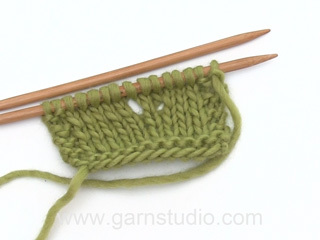 Cast on 8 sts on double pointed needles size 8 mm / US 11 with medium gray. ROUND 2: * K 1, 1 YO *, repeat from *-*. ROUND 3: K all sts - K the YOs twisted (i.e. work in the back loop of sts instead of front) to avoid holes (= 16 sts). ROUND 4: * K 2, 1 YO *, repeat from *-*. ROUND 5: As 3rd round (= 24 sts). ROUND 6: * K 3, 1 YO *, repeat from *-*. REMEMBER THE KNITTING GAUGE Repeat 5th and 6th round but on every inc there is 1 st more between inc (switch to circular needle when needed). When there are 112 sts on needle, K 1 round while inc 13 sts evenly = 125 sts. The bottom is now done. P 1 round. Now measure the piece from here. 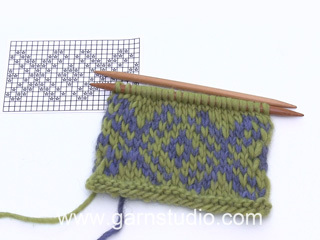 Work in stockinette st in the round until piece measures 4 cm / 1½''. Now work A.1 (= 25 sts) 5 times on round. When entire diagram has been worked vertically, work 2 ridges in GARTER ST - see explanation above, with off white. 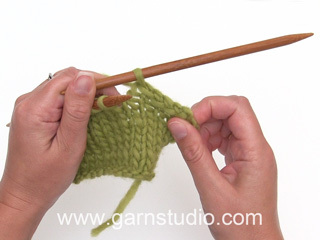 Loosely bind off - make sure that the bind-off edge is not too tight. Place the basket in the washing machine with a detergent without enzymes and optical bleach. Wash hot at 40C/104F with normal spin but no pre-wash. After wash shape the basket to the right size while still wet and leave to dry flat. At subsequent wash, hand wash the basket as a regular wool garment. Liebe Dagmar, leider können wir nicht alle Anleitung nach jeder Anfrange kalkulieren nor anpassen. Nehmen Sie bitte Kontakt mit Ihrem DROPS Laden auf, gerne werden sie Ihnen weiterhelfen -auch telefonisch oder per E-mail. Viel Spaß beim stricken! Hei Marita. Du øker 8 masker på hver omgang med øking, så du må strikke 13 økeomganger for å få 112 masker på pinnen. Siden annenhver omgang er uten øking har du strikket 26 omganger, 27 med den omgangen du øker de siset 13 maskene. Siden du strikker rundt vil det si 27 omganger fra midten og ut = 54 omganger tvers over hele. Med strikkefasthet på 15 rader i høyden = 10 cm blir dette 36 cm. Kan det være du ikke overholder strikkefastheten? Det er veldig viktig for at målene skal bli riktige. 1 maske mer mellom hvert kast betyr at du strikker: 6 omg: 3 rett, 1 kast. 8 omg:4 rett, 1 kast, 10 omg: 5 rett, 1 kast osv. God fornøyelse. Thanks for reply! 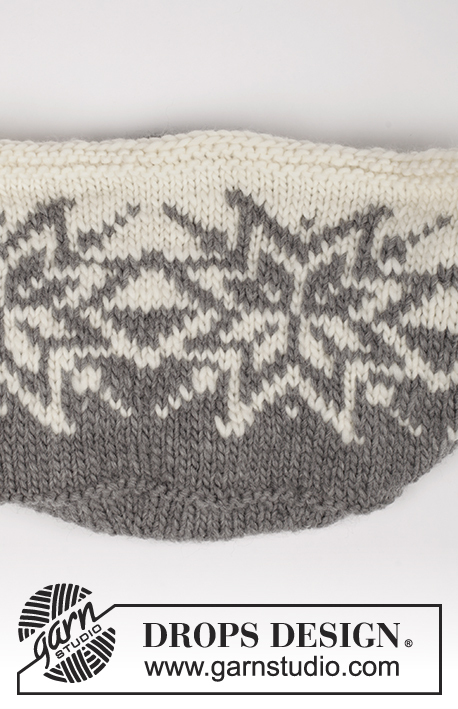 I ended up tumble drying it.....pretty good result now, but the pattern area did shrink more than plain knit. But the basket is beautiful and I will try again.....thanks Drops. 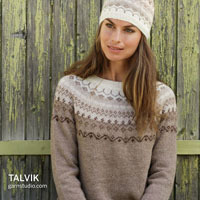 Only discovered Drops this year....and am loving knitting and crocheting again, your yarns and patterns are the best! My basket has not shrunk! It has felted a bit on the base but is all floppy......so disappointed. Made in Eskimo. Any help appreciated! 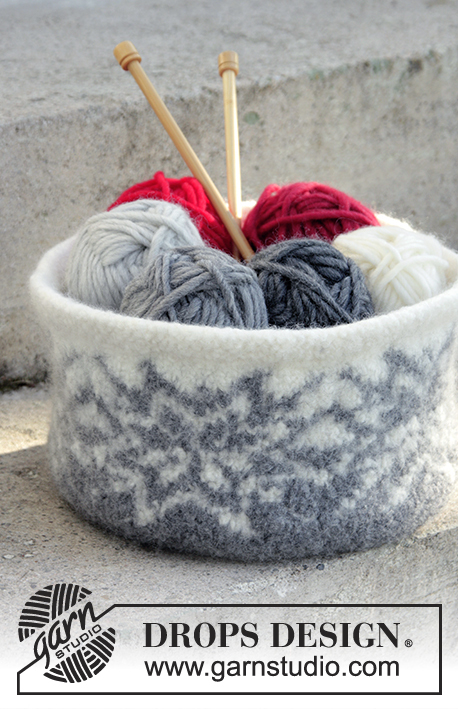 Dear Nora, Eskimo is a great yarn for felting, make sure you followed all the steps for felting - see here and make sure you used a "normal" wash program. Your DROPS store will help you if you have any further questions. Happy knitting! Pur avendo seguito fedelmente le istruzioni, uno dei due colori, quello del fondo, non sarà sufficiente per finire la seconda parte del motivo. Dovró procurarmi il quarto gomitolo. Buongiorno Barbara. Trasmettiamo la sua osservazione al settore design. La ringraziamo e buon lavoro! Hi, I love this! Just making it. But there is a mistake in diag A1 5th row There is 4 grey 2 off white1 grey 1 off white1 grey 3 off white and it should be 4 grey 2 off white1 grey 1 off white 2 grey 2 off white. Dear Aleksandra, thank you for your comment. You are right. We will correct the diagram. Happy knitting! I love the basket. Don't think I will get to it this year, but maybe next!